Have you watched Zootopia? It is considered one of the best movies from Walt Disney. It features a story about an unlikely team between a rabbit police officer and a fox as a con artist to uncover a conspiracy case of animals’ disappearance in a city called, Zootopia. And just like Finding Dory, the storyline is interesting and the movie is fun. In my opinion, it is a must-watch movie from Disney. Not only that the movie is good, you can also find tons of inspirational and great quotes from the characters. What I like about this movie is that the story is based on animals. Some animals are quick, like the rabbit, Judy Hopps, the police officer. While some animals are cunning like Nick Wilde, the red fox. Everything in the movie is a reflection of our real life. Everyone has their own unique ability. Some people want to bring peace to the world, some people have quick reflexes, some people are cunning, some have tremendous strength, and some are creative. 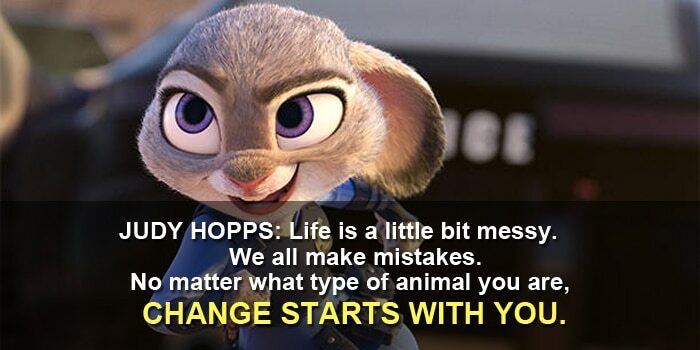 So which animal do you think you will be if you are to be part of Zootopia? Judy Hopps: Life’s a little bit messy. We all make mistakes. No matter what type of animal you are, change starts with you. 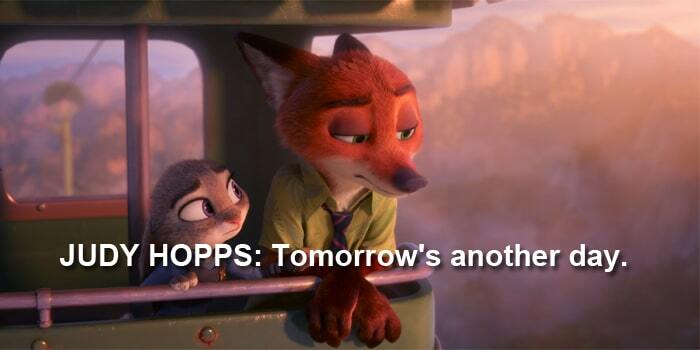 This is one of the best and most famous quotes in Zootopia. Judy Hopps, the rabbit police officer has a dream of changing the world to a better place. That is why she joined the police force to maintain peace and carry out her duty deliberately. And Judy is certainly right about it. Life is a little messy and everyone makes mistakes. However, that doesn’t mean that you are inferior and you cannot amount to anything. For things to change, you must first change. Everything starts with you. If you want to help the poor, stop being one of them and manage your finance to a healthy level. When you have enough, only then you can help those who are in need. You cannot help the poor by becoming one of them. The same goes for anything in life. If you want to make this world a cleaner place, start from yourself. Do not litter and spit anywhere. When you see rubbish on the ground, pick it up and throw it into the rubbish bin. If you want to do better and achieve greater success in life, learn to take control of yourself and your life. Change yourself. Improve and turn yourself into a model worthy for others to follow. 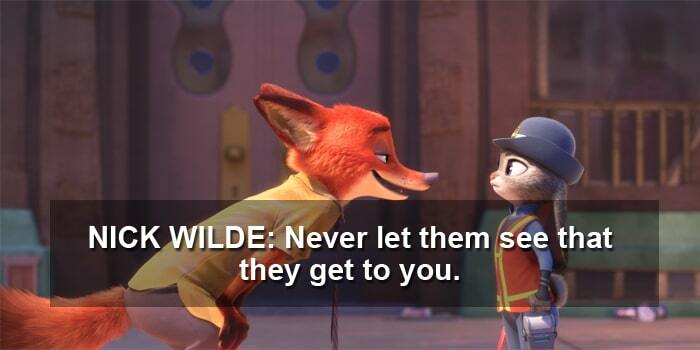 Nick Wilde: Never let them see that they get to you. Sometimes, no matter how tough or how challenging the situation is, you just need to have the courage to keep moving forward. You need to have the gut and the determination to continue to move on when everything is falling apart. The key here is without losing your enthusiasm. Most people never attain the success they want because whenever they face with difficult situations, they succumb and lose their faith. They started to lose their enthusiasm and eventually, give up on their dreams and goals. Never let this happen to you. Successful people are people who will continue to march forward no matter what happens. Judy Hopps: Sir, I’m not just some token bunny. Chief Bogo: You strike out, you resign. Sometimes, in order to achieve something amazing in life, you have to be daring. You have to take the leap of faith. It may seem scary and you may not be prepared. You might fall and you might fail. However, never let the failure determine who you are. Extraordinary people who went on to accomplish amazing success in life are people who dare to fail and they dare to take the leap of faith. Tech titans such as Steve Jobs and Bill Gates dropped out of school so that they can venture into a bigger opportunity. They took the leap of faith and did something extraordinary. There are many stories of amazing people who make bold decisions and take bold actions to achieve what they want in life. Some of them succeeded, while many of them failed. However, as long as you continue to move on and never give up, you will somehow achieve the success you want. Judy Hopps: I came here to make the world a better place, but I think I broke it. 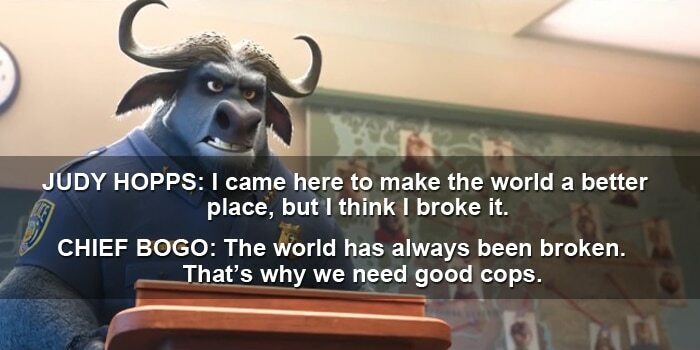 Chief Bogo: The world has always been broken. That’s why we need good cops. Never blame yourself for your mistakes. Nobody wants to make mistakes. Judy thought that she has done something bad to the world, but somehow, Chief Bogo inspires her to look at the good things. You should think and act the same. It is alright to make mistakes in life. In fact, you should make more mistakes in your journey to success so that you can learn more from the experience. If you never have never failed, probably, you have never ventured far enough. The more successful you are, the more failure you are going to make. Thomas Edison failed more than 10,000 attempts, but he never gives up and continues his experiment. In fact, he said that he has never failed; instead, he has successfully found 10,000 ways that did not work. So don’t take mistakes personally. Treat them as feedback for you to learn and improve. 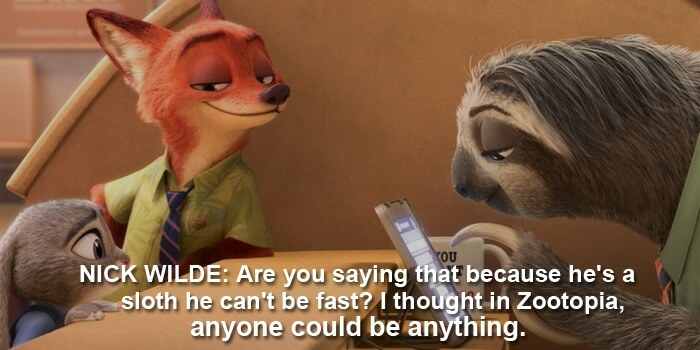 Nick Wilde: [in mock surprise] Are you saying that because he’s a sloth he can’t be fast? I thought in Zootopia, anyone could be anything. This is the part where Nick Wilde, the red fox mocks Judy Hopps. Judy has big dreams and she always believes that anyone can be anything. However, when she wants to solve her case fast, she encounters sloths that work slowly. While I believe that it is true that anyone can be anything they want to be, you just need to be creative. At the end of the movie, you can see Flash, the sloth drives a sports car drive by. Yes, sloths are slow, but they can leverage on speed cars and or anything that makes them fast. So basically, anyone can be anything, is true. You just need to be creative enough and leverage on whatever you have in life. You may be a slow learner or you may not be able to speak English well, but it doesn’t mean that you cannot be successful. We have seen extraordinary people such as Soichiro Honda, who has never been to formal school, went on to build one of the biggest automobile manufacturers in the world. You might be a sloth, but it doesn’t mean that you have to be slow. Chief Bogo: Life isn’t some cartoon musical where you sing a little song and all your insipid dreams magically come true. So let it go. Guess what, Chief Bogo was absolutely right. Your dreams will never magically come true without you playing your part. In fact, the bigger your dream, the more sacrifice and hard work you need. Most people have big dreams. When you ask people what they want in their lives, they will tell you that they want to be rich, they want to be financially free, they want to own a big bungalow by the sea, they want to travel first class, etc. However, most people do not have the determination and commitment to transform their dreams into a reality. They say that they want to build a successful business, but you will never see them working hard to build their businesses. First, decide what it is that you want in life. Second, determine that the price that you are going to pay to get the things you want. And third, resolve to pay the price. Obviously, most people lack step number three. They never resolve to pay the price. They choose to sleep late rather than waking up early to work on their dreams. They choose to watch TV rather than spending time working on their business. 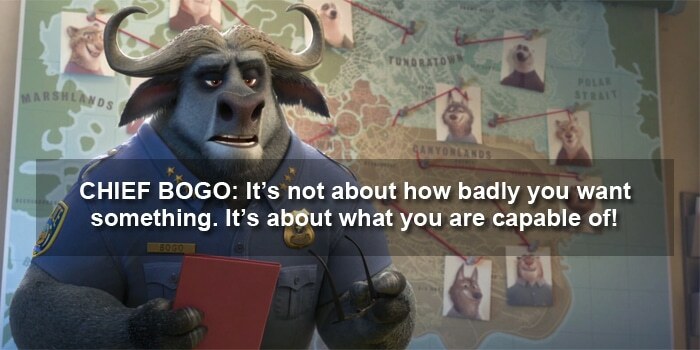 Therefore, always remember Chief Bogo’s quote, your dreams are not going to come true easily. You don’t have to let them go, but you must resolve to commit to taking action and be determined until you achieve what you want. Judy Hopps: Tomorrow’s another day. There is always a new beginning. It does not matter whatever has happened to you. You can come from a poor family or you can be in serious debt, but your past does not define your future. If you are poor and are in debt right now, does that mean that you are going to stay this way forever? If you have never been to school or has failed in business, it doesn’t mean that you will continue to fail in the future or everything you venture into will never work. What has happened was just temporary and things will change. Where you are right now is just where it is right now. Always remember this, your past does not equal your future. If you tried something and you fail, well, just try again. Even if you tried it a moment ago and it did not work out, you can always try again. Or better yet, improve your strategy and then try again. There is always a new beginning and you can start fresh every day. 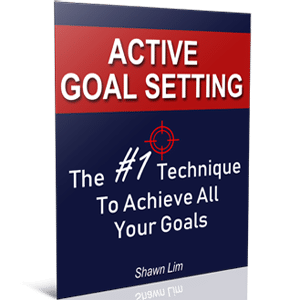 So what if you set goals and fail to achieve them? Answer: set the goals again and then just try again. You can improve your plans to get better results. Judy Hopps: I mean, I am just a dumb bunny, but, we are good at multiplying. This is all about being optimistic. You can be bad at anything, but always choose to look at the good things in life. No matter where you are right now in life, there is always something positive to look for. Even if you are in debt, having no money to pay the bills, or are overweight, it doesn’t matter. You can always choose to look at the positive side of things. When you are broke, tell yourself that you are still alive and as long as you can still breathe, you will be able to do something to turn the situation around. When you focus on the positive side of life, you will notice that things will start to change. You will feel better and you will tend to work on the solutions rather than dwelling on the problems. And when you work on the solutions, the situation will become better. So what if rabbits are stupid? They are good at multiplying. Look at the bright side of life. Choose to be positive and think optimistically. Chief Bogo: It’s not about how badly you WANT something. It’s about what you are capable of! Well, what Chief Bogo said, may be only half true. You have to understand that there are always two sides of things. Sometimes, you have to have the burning desire and the commitment to reach for what you want. And sometimes, you need to consider your own capability and not to overdo yourself. So which one is true? In my opinion, I believe that both are also correct. Anthony Robbins once said that he believed that when there is an absolute commitment, anyone can achieve anything they want in life. On the other hand, if you are not prepared and you dive straight into something, you may end up failing. Just like driving the Formula One race car. If you are not well-trained or you have never trained to drive, you will crash and you may die. Know your own capability and prepare for what’s coming. The same goes for climbing Mount Everest. If you overestimated your own capability and you go for it without training, you will suffer the consequences. The commitment and willpower are what get you started. And what makes you successful are your capabilities, your abilities, and your skills that you developed from your commitment to learning and getting prepared. When you have both the capability and the desire, success will definitely be yours. 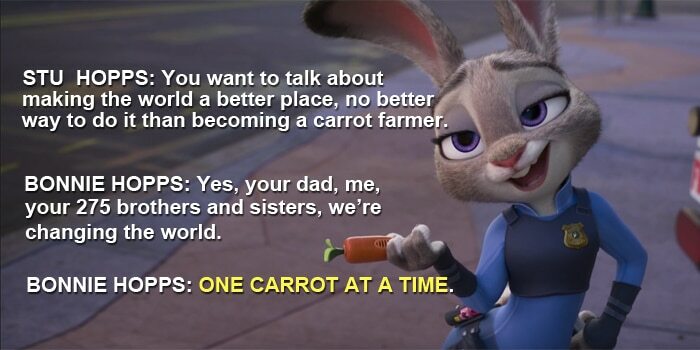 Stu Hopps: You want to talk about making the world a better place, no better way to do it than becoming a carrot farmer. Bonnie Hopps: Yes! Your dad, me, your 275 brothers and sisters, we’re changing the world. Bonnie Hopps: One carrot at a time. Stu Hopps: Amen to that. This is the Hopps’ family showing their optimism and positivity toward life. They are rabbits and they are carrot farmers in the movie. And they are extremely positive people, well, rabbits. And yes, you can change your life and the world, at one step at a time (not with carrots). A lot of people thought being successful is such a big thing and they don’t feel like they are capable of achieving it. This is simply not true. Success is about taking one small step at a time. Do you think that Bill Gates built Microsoft into a billion-dollar empire in just a few days? Rome was not built in a day. It requires tremendous and consistent effort to achieve outstanding success in life. And anyone can achieve the success they want, as long as they are willing to work on the small steps, each day. I like what Robin Sharma’s ideas when he talked about taking consistent small steps to success. He said that all you need to do is to commit to taking just five little actions every day. With five small victories a day, within a year, you will have accomplished 1825 victories. And do you think that these 1825 small victories will make you more successful in life? Of course, so just start with taking small actions each day; one carrot at a time, or one step at a time. This is just like the Butterfly Effect, which states that small causes can have large effects. If you read just a book a month, you will have read 12 books in a year. And within 3 years, you will have read 36 books. This small action will actually change and improve your life for the better after some time down the road. Therefore, harness the power of taking small action steps each day. 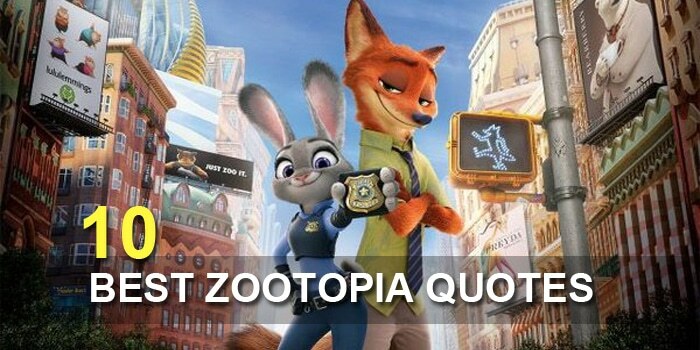 These are the top 10 Zootopia quotes in my opinion. Maybe there are more which I have missed out. You can always share your thoughts with me by leaving your comment below. Whenever I watched a movie from Pixar and Disney, I will always look for the golden life lessons from the movie. The same goes for Finding Dory. Not to mention Dreamworks’ Kung Fu Panda. I love all these movies. They are inspirational and they contain wisdom and lessons that will help us grow in life. Remember to share this post if you like it. Usually I never comment on blogs but your article is so convincing that I never stop myself to say something about it. You�re doing a great job Man,Keep it up. Your message is amazingly similar to my book recently published. I wrote wisdom and lesson from English proverbs with a lot of quotes from books by Nietzsche and movies including ‘Zootopia’. I like your work. I really love your article. It’s very good for my life. I love Zootopia. Hello Violet, great to hear that. Do check out my other articles like the Kung Fu Panda quotes too. They’re great! 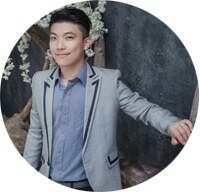 Thanks you very very much,i have been struggling with depression for the past 1 year,and now after reading your article,i started to feel alive.i got some hope.so thank you very very very much.May the God bless you.